VEG's Dad: I would just like to say that I am thrilled she has a father like you. All the underlying tones of you being supportive and encouraging this whole time. It helps me know that decent parents still exist on the planet. You are raising a world-changer, Dad... we can all sense it. She is an enigma: a child who cares more for others than herself. Thank you for being a great father... and we look forward to many more months if not (hopefully) years of pictures and ratings. Truly a unique and fascinating blog. Thank you, Grace. You said it all. NeverSeconds has become a part of the lives of so many people all over the world in a strange and magical way. It reinforces the interconnectedness of us all so naturally that one feels - despite everything - there is hope for the future when there are people with the simplicity and nobility of VEG and her inspirational family. It took me just under 10 seconds but I was trying to time myself so it might be less than that lol. Anglesey is pretty easy to find when you know where it is. Congrats on the Jamie Oliver award - very well deserved! Looking forward to the Never Seconds World Tour! Congrats VEG on winning blog of the month! Well done on the award - so deserved. Have a really great break!!! Indeed, thank you and Veg's Mom for providing such an encouraging and learning environment! If we don't ask questions, we will never be provided answers, and if we don't stretch our boundaries via sleep-away camp and the internet, how can we find the fodder for our questions! I look forward to reading from the NeverSeconds Guest Bloggers, it sounds grand. Grace from Iowa took the words out of my mouth. Martha clearly comes from a loving and supportive family. We don't hear much about 'mum' but she packed a lovely, inspirational lunch the other day. I thought the chrysanthemum was a super touch and Veg ate it. I didn't know you could eat chrysanths so I'm still learning at my ripe old age (71). I hope the Payne family has a lovely summer break and I look forward to hearing from Matha again when the new term starts. Actually, dandelions have another edible use. They've been called "poor man's morels." As you said, be careful of where you pick them. You don't want them loaded down with pesticides (or where animals have been peeing on them). Take them inside, rinse them off, shake off the excess water, then dredge them in flour and pan-fry them up in a bit of butter (or olive oil or margarine or whatever) until they're golden brown and a bit crispy. Drain them on a paper towel. Optional: sprinkle them with just a tiny bit of salt. You'd be surprised at how much they honestly do taste like morel mushrooms! It would seem natural to assume that they'd taste bitter, since anybody that's ever gotten any of that white "sap" in a dandelion plant in their mouth knows full well. But they aren't! Looking forward seeing details of your trips, maybe you could start a 2nd (personal?) blog telling us about your days? and keep this one going as it is. Sounds like an interesting & unique idea. I was in school many decades ago here in Ohio, USA, and it's been fascinating to see how different school lunches are now, both in Scotland and around the world, from when I was in school. 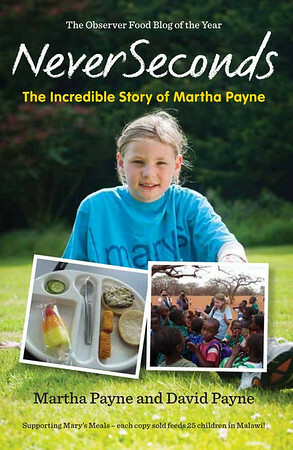 All the best to Martha & Dad, and to the kids who will benefit from this unbelievable effort. It is a joy to read and a miracle to behold. Keep up the great work! dear Veg and Family, what a fab blog and a lovely idea. Well done on all the fundraising, have a great school holiday. Took about 4 minutes. Used Google Maps and then zeroed in to the school by swicthing from the map setting to satellite. School is at the intersection of Tyn Pwll Rd. and Cyttir Rd. Can just see the white roof through the cloud cover surrounded by an enormous green space. Cool! I also agree with Grace and Neesargon that you have a wonderful family giving you such enormous support. I hope if you do move on you will groom a replacement and pass the camera if not the torch. This is such a charming endeavour for all of us all over the world! Hi VEG! Eversince I saw your blog featured in a news article, I see to it that I visit NeverSeconds daily! Your blog will always be an inspiration to many people, young and old alike. And I just can't help my eyes to get misty and all everytime I read your posts and watch your 2 videos. Cheers to a great world tour! Keep on putting smiles in our hearts (and faces as well!). Veg, congratulations on The Blog of the Month award! I am so excited about your upcoming travel blogs, I will feel like I am traveling with you! Thank you, and safe journey! BIG congrats on the award Veg! Very well earnt! Have a super holiday, you deserve it. Congratulations on your blog award and keep up the great work. That is fantastic news you have been awarded Jamie Oliver Blog of the Month. It is well deserved. I notice someone has posted about eating dandelions. This is true. You can pick the leaves and eat as you would lettuce. The book to get on the subject is Food For Free by Richard Mabey, but also ensure you have a very good field guide. I was only thinking of Richard Mabey a couple of days ago. A special treat for me on Friday was to visit Guildford and have lunch at the Guildford Institute where the food is always delicious. A lady brings in her own home-cooked food. A meal deal where you get main course and desert (free fruit juice) costs £7-95. Tea or coffee is extra. We also usually have artworks on the wall as used as free exhibition space for local artists. Artists pay a commission if they sell anything. On Friday watercolours, but not easy to see as covered in glass or plastic sheeting. If you go out to eat you may wish to write about it. If the food is good, ask the chef for the recipe (that is what I do). As much as I hate to admit it, I'm a bit overweight ( should lose about 15 kg ). Which just makes me feel horrible if I see all those hungry children. ( I could save almost 2 euros just having a healthier lunch , and a lot more if I stop eating snacks ). What I propose is the following : all the money I save just by eating less , I will donate to your Mary Meals page. So you can expect a regular donation from me, it won't even cost me anything more, it will make me healthier, and help fight hunger. Just wanted to share this idea. I know I'm not alone. Still have to work out the details, but I plan to start tomorrow , and donate at least every week. Interesting. Really looking forward to this. Good for you, Martha! Who would have thought a simple blog (and a little bit of controversy) would have kicked off a grand adventure. And thanks to you, Dad, for bringing all of this to life. I have nominated Martha and NeverSeconds for a Food and Farming Award, will you? Yes. Most certainly. I have added a second nomination. Congretulations on the Jamie Oliver Blog Award VEG (and VEG's dad). Also voted and emailed some friends the link asking them to do the same. Keep voting and pass it along to others. Listening to the Food Programme lunchtime today on BBC Radio 4 (repeated 1530 Monday 2 July), it was said writers of food blogs have greater influence than food writers! I can't wait for the world tour to begin! Congratulations on getting Blog of the Month as well. Very well deserved. I can't WAIT for the next post!!! took me quite a while to find anglesey on the map as I was scouring the coastline rather than looking inland. Big mistake! I'm excited to read the guest bloggers and learn more about their dinners. Really happy for all of the neverseconds crew for their great success!